Chinese tourists are starting to spend more on experiences rather than on things. As luxury brands and retailers globally gear up for millions of tourists during China’s upcoming Lunar New Year holiday, a survey released Thursday indicated that consumers in the world’s second-largest economy are no longer as eager to simply shop. Rather, they are more interested in sightseeing, entertainment and food. 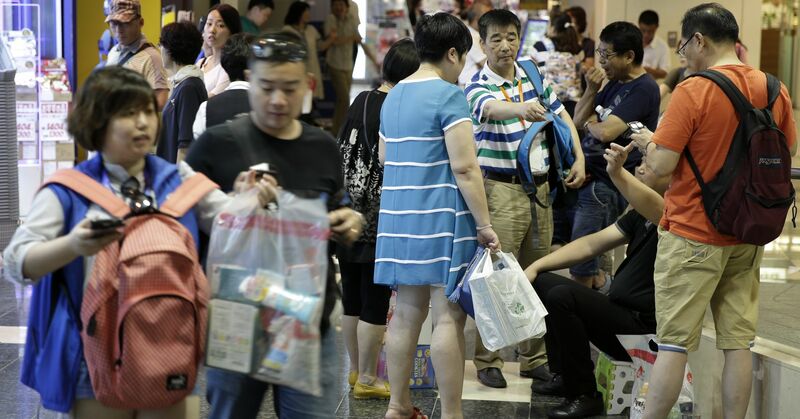 The amount that Chinese tourists spent on shopping fell to less than a third of the overall trip budget, or 32 percent, in 2018, consultancy Oliver Wyman found in its latest study of outbound Chinese travel. That’s compared to 41 percent of the total trip budget in 2016, the report showed. The average amount spent on shopping also declined to 5,800 yuan ($855) last year, from 8,000 yuan in 2016, the report said, citing a recent survey of 2,000 Chinese traveling overseas. For the first time in the survey’s brief history, less than half of the respondents named shopping as one of their top three reasons for going abroad. In contrast, food and beverage, sightseeing and entertainment increased their share of the trip budget, according to Hunter Williams, partner at Oliver Wyman. A slowdown in China’s economy and pressures from trade tensions with the U.S. have raised concerns about the propensity of the Chinese consumer to spend. Retail sales growth slowed last year, and auto sales declined for the first time in years, according to official data. Earlier this month, Apple also cut its revenue expectations, citing “economic deceleration” in Greater China. However, analysts have noted the iPhone maker also faces other challenges such as increased competition from local Chinese smartphone manufacturers. In the last few months, fashion brands Burberry, and Dolce and Gabbana have also come under fire from Chinese social media users for controversial advertisements. Overseas businesses may also need to adapt to Chinese mobile pay, which is part of daily life domestically. A report co-issued by Nielsen and Alibaba-affiliated Alipay on Monday said more than two-thirds of Chinese tourists said they used their smartphones to pay abroad in 2018. Of merchants who responded to the survey, 56 percent said sales improved after adopting Alipay. Tencent-owned WeChat Pay has also partnered with Paris-based department store Le BHV Marais by launching the mobile payment service there and opening a pop-up store for Chinese New Year, according to a release Wednesday. Chinese travel booking site Ctrip expects 7 million Chinese to travel abroad for the holiday, which officially takes place the first full week of February. The country’s Ministry of Culture and Tourism said there were about 148 million Chinese overseas trips last year, an increase of more than 13 percent from the prior year. Still, travel is not immune to China’s overall economic struggles. Official data on Monday said that gross domestic product in 2018 grew at its slowest pace in 28 years. And despite an overall increase in Chinese overseas tourists, the pace of growth slowed in the second half of last year, Williams pointed out. Ctrip partly blamed the “macro slowdown” in November when the travel agency warned its operating margin would fall to between zero and 1 percent in the fourth quarter, versus 20 percent in the third quarter. Two-thirds of respondents in Oliver Wyman’s survey said they used Ctrip to book flights and hotels, up nearly 20 percent from 2017. Alibaba-owned Fliggy ranked second, while Beijing-headquartered Qunar was third.